Summer and fall is popular time for traveling. There are many dream places we wish to visit, for the unique experience, fascinating culture, and special food to enjoy. Most of those places we learned often from reading books, watching movies, or being recommended by others. 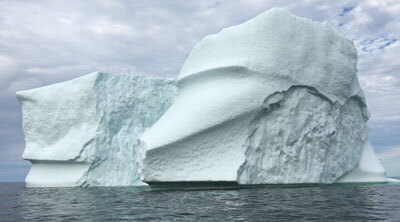 My little quest for icebergs this July long weekend turned out to be a bit more than I expected. It was a return trip to the northern part of Newfoundland, as I missed seeing the icebergs last year on my visit in August. From Gander Airport, I set out to the area with the most reported sightings of icebergs by travelling tourists. I feasted my eyes on a commercial trip where I was able to get very close. Mission accomplished, so I thought. Just as I made plans to switch from berg hunter’s mind to a cultural experience in Twillingate, for the remaining one and a half days before returning home, I learned about another giant iceberg off the coast in a very remote village. With little thought, I cancelled my accommodation, the live theatre and dinner plans I’d made for my last day, and headed out by car – 450 kilometres each way! I arrived at Fleur de Lys around 5 pm. The tiny little out port community of around 250 people is located at the end of Highway 410. At the top of the road, a giant iceberg appeared in my sight! It had, in fact, been there for days, but the community is so remote, no tourist had reported it. My next wish was to view it from up close. 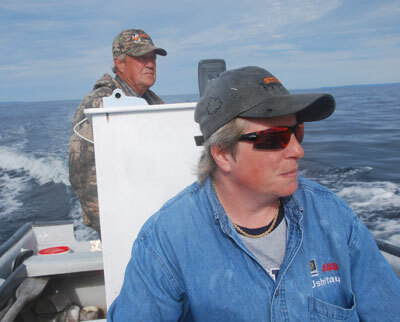 I asked two local fishermen, brother and sister Patty and Sal, who were heading out for an early evening fishing trip, to take me on their boat. We circled around the iceberg to thoroughly enjoy the giant beauty, every angle of it. My dream was real! Here I was, at the far eastern end of the country, in the ocean, in a boat with two authentic local fishermen, enjoying this giant natural beauty! The next morning, my breakfast was a feast of eggs, ginger cookies and fresh brewed coffee (donated by fellow travellers) with the magnificent view of the iceberg. I had no doubt that my side trip was the best thing I could’ve done. In my master plan, I would’ve never had set aside time to visit a tiny town like Fleur de Lys, but my visit truly left the most memorable experience. It made my trip much more than about me: it became about the people, the land, and the majesty of these remote, rural areas. When traveling to exotic places, it is never just about the things we see, but also the people who bring the place to life. Next time you are on the road, before you say “there is nothing else here to see or do”, keep an open mind. It truly raises the bar on your travel experiences, making them greater than you had originally set out for! Happy travelling! Experiences like these create lifetime memories!